If you're prone to using multiple devices at work throughout the day, how does your chair support you? When you're seated in the Steelcase Gesture Chair, the answer will be "in every which way." Designed to fit the widest range of users and tasks while taking up the least amount of space, the Gesture is the infinitely-adjusting chair that ensures you're always sitting with the right amount of support. After years of studying the alternative postures that people prefer sit in when they engage with their tablets, phones, and devices, Steelcase's designers made it happen, creating the ideal ergonomic chair for the future that delivers much more flexibility at work, starting with its arms. 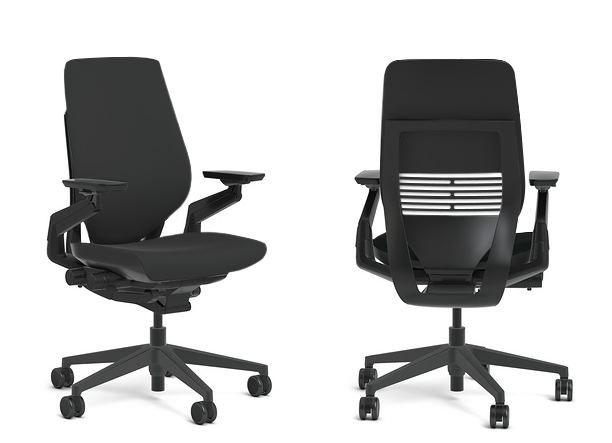 Set toward the back of the chair, 360° rotating arms (which raise, lower, and pivot) support healthy movement, and remain at the correct ergonomic angle whether you're upright or reclined. No matter what device or task you have at hand, the Gesture's arms are there to offer steadfast support, and can even be moved out of the way when you don't need them. Then there's support your lower back; LiveBack Technology automatically adjusts to imitate your spine's natural movement, working through a series of synchronized interfaces, and providing personalized lumbar support that'll keep you focused and working comfortably. The core-equalizer works with your body to stabilize back and abdominal muscles while the height-adjustable lumbar support fits even the tallest of users. Paired with adjustable back tension, a variable back stop, and an optional height-adjustable lumbar support, the Steelcase Gesture Chair will change the way you think (and feel!) about office seating forever. Is there any way to cut down on the lead time? 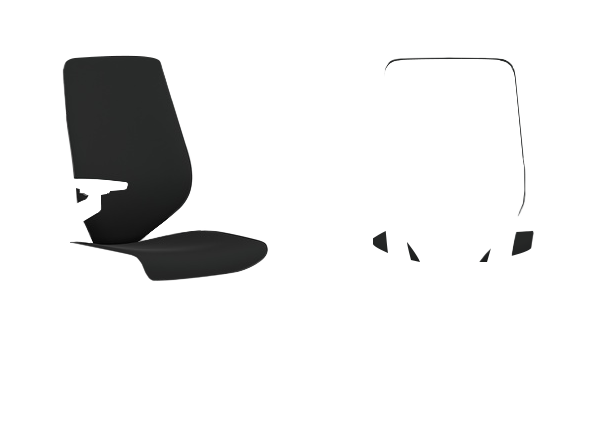 If you don't want to wait for you chair, check out the black Gesture Chair that ships out the same day. What is the difference between this and the Leap? The Gesture features different arms, padding and styling from the Steelcase Leap. Does this come with a headrest? Yes, the Gesture Chair is available with a headrest on a separate listing. Can I add the headrest at a later time? No, the headrest cannot be added at a later date. If you want a headrest, you will need to purchase the version with the headrest. Is this chair available without arms? The arms are integral to the design of this ergonomic chair. 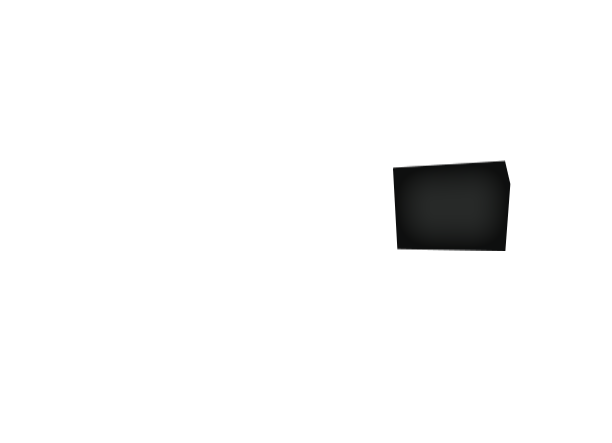 The Gesture Chair cannot be ordered without armrests. Can I add the adjustable lumbar support after I purchase my Gesture? No, the adjustable lumbar support cannot be retrofitted to the chair. If you want the adjustable lumbar support, you'll need to add it when you first purchase the Gesture Chair. 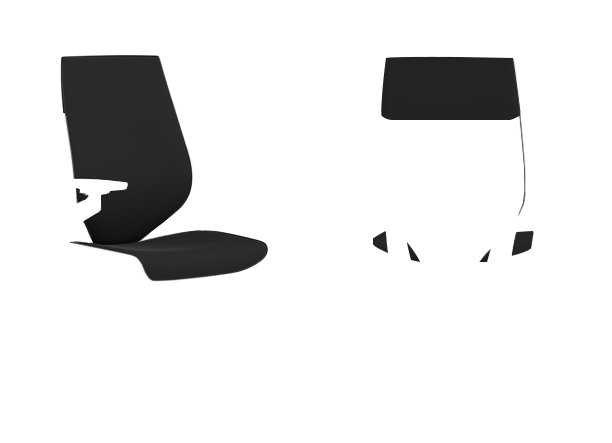 The Steelcase Gesture chair can be ordered with a hard plastic shell back or a partially upholstered ''wrapped'' back style. Select hard casters for carpeted floors or soft casters for hard floors, including concrete and tile. Plastic glides are also available for users who would prefer for their chair to stay stationary. Solid construction and very adjustable. Have only had the chair a week, but already find it supportive and comfortable. Just wish that you could lock the arms in place somehow once you got them adjusted. Overall, would highly recommend this chair! This chair has done wonders for my back. Can sit in it for any period of time without soreness or pain. Feels like it should last a long time. If you can afford it and the aesthetics are to your liking, it's worth having. I'm not going to get into too much detail because there's already enough info out there about this chair, too much to get into here. I researched a lot of chairs and decided this was the one for me. So far it seems worth every penny. With the uplift desk combo it was cheaper here than anywhere else. -Wish the arms were a bit more adjustable. You get about 5 levels of height, 5 levels of side tilt to the arm pads, and the side to side rotate motion of the whole arm, while adequate, could have been wider. Also would have been nice if the entire arm had the ability to slide from front to back to some extent. The arm pads do however slide front to back about maybe 3 inches. $1,010.00 List Price: $1,605.00* The list price is the same as the MSRP (Manufacturer's Suggested Retail Price). It may not necessarily be the price at which the product is sold.